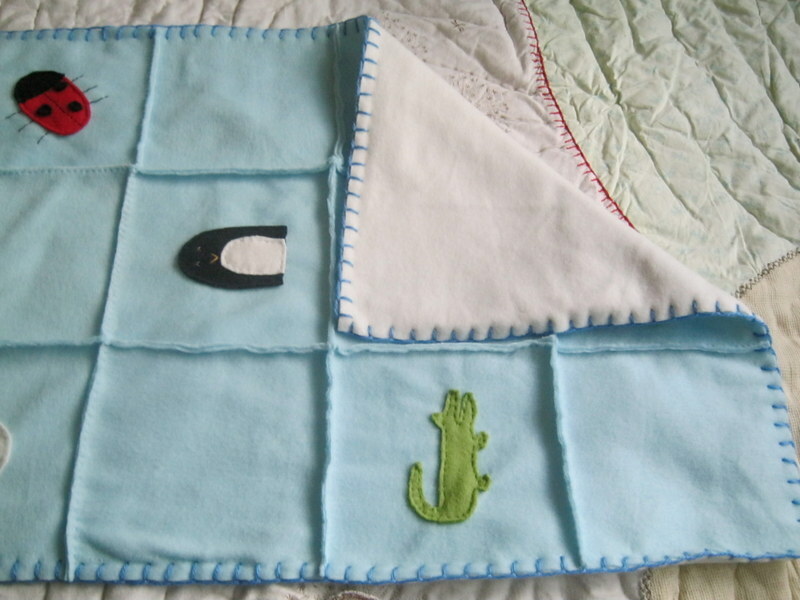 Last time I talked you through how to make the separate squares and appliqué the various designs onto them. In this post, I will talk you through how to sew the squares together; how to line the blanket; and how to finish it all off. Please see my last post for links to how to do the stitches if you are unsure. First, lay your squares out in the way you want the final blanket to be. I chose to do 6 blank squares and 6 patterned squares and arrange them as above, but there is no reason why you couldn’t change the order around, or do strips of animals and blanks. Then, with wrong sides together, line up the joining edges of your top two squares. Using a running stitch, sew just below the top of the fabric (this is what give the ridge effect on the final blanket). Fasten off. Take the next square and sew it in the same way to the last square. Keep adding the squares, making sure you keep the order that you originally chose. It’s very easy as you can see your blanket all the time, as you are sew wrongs sides together, the right side should be facing up. I hand sewed this stage, but you could use your machine if you have one. I just couldn’t be bothered to get it out, and I find hand sewing relaxing. At the end, you should have an almost finished blanket. Now all you need to do is line it and finish it off. I used fleece for the lining as well. This was partly because it’s easy and partly because I actually cut up Ikea blankets, which were cheap but quite thin, so I didn’t feel that two layers would be too warm. I’m afraid I didn’t measure the lining out accurately with a tape measure, I just laid the blanket on top of the lining and cut around it. It worked remarkably well! Attaching the lining, also happens to be the finishing off part (I love fleece with it’s no fraying seams!). Simply match the lining to the blanket, wrong sides together and pin into place. 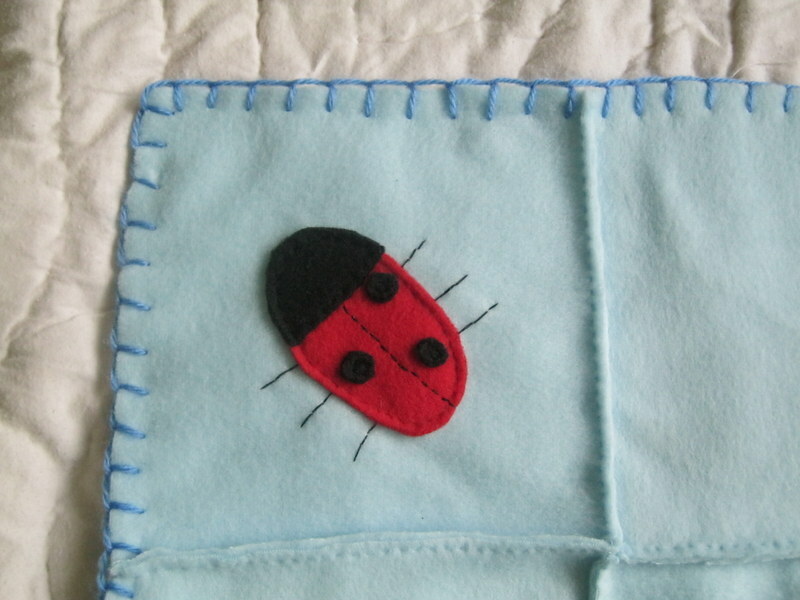 Then, with your wool, blanket stitch all the way round the edge. 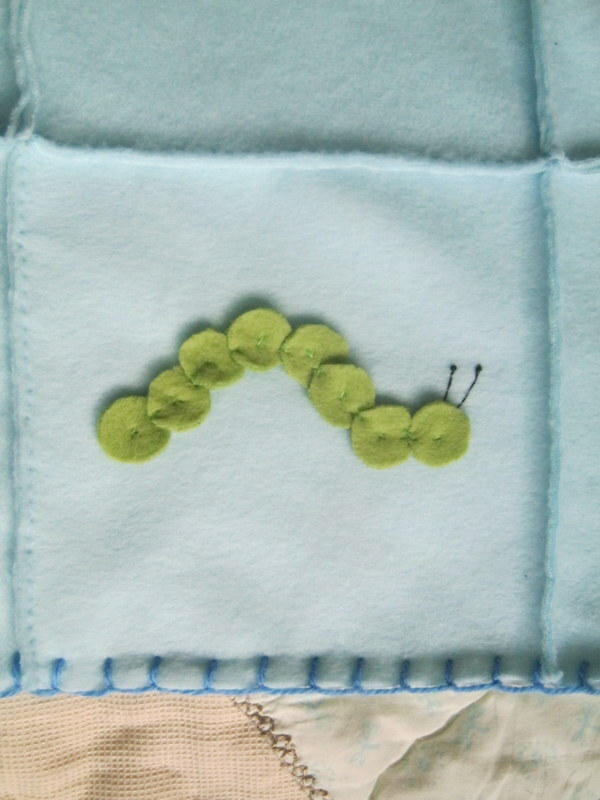 I have to confess, I’m not that good at blanket stitch and had always seen it as a kind of nemesis, something, I realised after this project, was rather silly. I think it’s because I hadn’t done that much before. After this blanket, I actually quite enjoy it, having managed to get my head around it! Well now you will have a finished blanket. I really enjoyed making this and I think a few more people may be getting a variation of it! I find that normally my first attempt at something is often when I learnt he most and have the most ideas spiral off from it, even though I have put a lot of time and thought into the initial design. 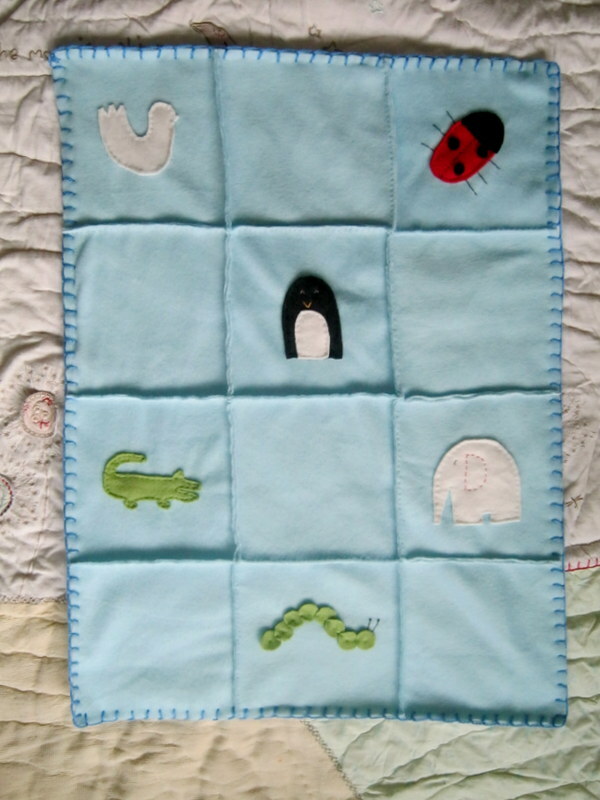 This blanket for example, I designed to look ‘handmade’ and on paper, the animals looked like the right size. However, if I do this again, I’ll make the animals (or motif, they may not be animals), bigger. Still I’m pleased with the final result and I hope my friend is!